JACQUELINE WILLIAMS has appeared at Court where she appeared in Harvey, Man in the Ring, and Gem of the Ocean (Aunt Ester); The Good Book; Caroline, or Change (Dotty); Fences (Rose, Jeff award); Electra (title role); and The First Breeze of Summer. 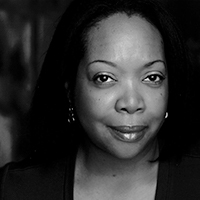 Most recently, she played Bell in Marcus Gardley’s world premiere A Wonder in my Soul at Victory Gardens, where she also appeared as Makeda in Gardley’s The House That Will Not Stand (Jeff Award). Her long association with Goodman Theatre includes stop.reset., Pullman Porter Blues (some performances), Blues for An Alabama Sky, Camino Real, The Trinity River Plays, The Amen Corner, Richard II, The Story, Ooh-Bla-Dee and many others. Chicago: Steppenwolf (The Christians, Airline Highway, Head of Passes, The Hot L Baltimore, The Brother/Sister Plays, Othello, and others); Victory Gardens (Gospell of Lovingkindness, The Colored Museum, and others); Northlight (Gees Bend, The Miser, and others); Next (Yellowman, Fabulation); and Fleetwood-Jourdain (Maya Angelou in the premiere of Maya’s Last Poem, Going to St. Ives, Having Our Say). Regional: Asolo Repertory (Tillie in Frank Galati’s production of Guess Who’s Coming To Dinner), La Jolla, Huntington Playhouse, ACT Seattle, Berkeley Rep, Portland Stage Co., Arena Stage, Hartford Stage and more. Tours: Crowns and Born in the RSA with Market Theatre of Johannesburg. Broadway: The Young Man from Atlanta. Off-Broadway: From the Mississippi Delta (co-produced by Oprah Winfrey), Mill Fire, and The Talented Tenth. TV/Film: cast of Turks, Empire, recurring as Officer Beccera on Chicago PD and Chicago Fire, Chicago Code, Prison Break, Heartlock, The Break Up, The Lake House, and Hardball. Awards/Nominations: Jeff, Helen Hayes, BTAA, Lunt-Fontanne Shakespeare Fellow, 3Arts, American Arts Council, Drama Desk, Sarah Siddons, Excellence in the Arts, After Dark, among others. This fall she will reprise her original role of Mae in Tarell McCraney’s Head of Passes opposite Phylicia Rashad at Mark Taper. Jacqueline holds a BFA from Goodman/Theatre School.